Those responsible for Helix at the time would take nearly four more years to put out a version that would run on the new chip, releasing Helix Express 3.5 in August of 1995. A mere eleven years later, the PowerPC was gone. Apple shifted gears again and released the first Intel Macs in January of 2006. It was barely a month before that release, in December of 2005, that we shipped Helix Server 6.0, the first Helix product to run in macOS. One day, when the very happy history of Helix is finally written, with our struggles behind us, it will be painfully clear how awful a stumbling block the move to Intel was. We had already passed the fork in the road when we decided in 2002 to focus our efforts on Helix Server, allowing Helix offices around the world to continue functioning when their ancient Macintoshes had to be replaced and the new machines would no longer boot in OS 9. In the spring of 2008, we released the first Helix product to run natively on an Intel Mac. For the next year and a half, we raced as fast as we could to stay ahead of the twin tidal waves of dying machines and the imminent demise of Classic. Before we could get back to work on RADE, we had to get our macOS interface running properly on both PowerPC and Intel processors. That meant finishing the macOS Client and Engine. As many of you have already discovered, 6.1.5 is, at last, quite good. Several upcoming enhancements will put its performance on a par with Classic, eventually surpassing it. The big story of 6.1.5 is, however, that the fires are out and we have now shifted our focus to RADE. The first release of what is now called Helix RADE shipped in December of 1984. Twenty-five years later, tonight, at last, you will get your first real look at the Helix RADE of the future. And almost as important as that — as we have several times before — we will be soliciting your thinking about some of the philosophy behind both its design and our plans to finance it the rest of the trip. Heads in the clouds or feet on the ground? At the 1992 Apple Worldwide Developer Conference (May 11-15, 1992, San Jose, CA), a bright orange banner across the entrance proclaimed, "Change is certain. Progress is not" (E.H. Carr, 1892-1982). Consider asbestos. People have been aware of the health hazards of asbestos since the ancient Greeks. Yet through the ages, society has made extensive use of asbestos: As insulation and fire-retardant, in heat-, fire- and acid-resistant gaskets, even drywall joint compound. But in recent years it has fallen into disrepute and has been partially banned in the United States and Canada for over a decade. In 2005 it was banned entirely in the European Union. This is change, but is it progress? The point here isn’t to enter into that debate; rather, to point out that change — even change that most people would say is for the good — comes at a price, and is never pain-free for everybody. One of the dangers in change is that some of its effects are not immediately recognizable, making it difficult to assess whether or not the initial decision was worth the risk. Remember when Macs were the computers “for the rest of us?” Well, those days are gone, as are a few of our friends from those early days. The typical Helix user has been at it for 20 years or more, and as they say, “we aren’t getting any younger.” But our children live in a world where computers are just part of their reality. Children don’t analyze the roles computers play in their lives, they simply use them without considering the impact on the way they live. The revolutionary technology of our youth becomes the wallpaper of our children’s world. Its impact is irrelevant and they are seduced by its entrenchment. Trends do that to people, changing their lives before they have the ability to consider the consequences. Now consider “cloud computing.” Today, industry statistics indicate that as much as 70% of software is custom developed and locally controlled while 30% is “leased.” Under a lease arrangement, you use a program (now referred to as a “hosted app”) that is on a remote server. These remote servers have come to be referred to as “the cloud.” You are not responsible for the cloud’s maintenance, and when the software is upgraded, the process is transparent. But in exchange, you give up control. So-called industry experts predict that within five years cloud computing will be the dominant arrangement. Again, this is change, but is it change for the good? Our parents taught us that if we’re looking for help, we can always find it at the ends of our arms. Back in the 1980–1990s (as much younger men and women) many of us looked to Helix as a tool we could use to help ourselves, particularly, to manage the growing complexity of our lives. At its core, Helix’s elegant relational database structure gave us places to organize our “stuff,” from things we formerly wrote in ledgers to contacts we kept in a Rolodex® to pictures we used to paste into scrapbooks. Helix not only allowed us to organize our data; it also allowed us to control the way we put that information to use. We could change its structure if and when we chose to. When it comes to controlling (and owning) your data, Helix is at one end of the spectrum and cloud computing is at the other. So how does Helix fit in this new world? Although today’s typical user doesn’t seem to mind surrendering their data to ‘the cloud,’ there remains a group that prefers to be able to dictate rather than to be dictated to, yet sees the good in cloud computing and looks for ways to embrace it. It is for them that we are creating a new Helix RADE, one that is at once familiar and at once completely new. If our plans work out, Helix — the tool that was once so far ahead of its time — will once again become a vital tool for the moment, a shield against a tide of conformity. Now if you’ve seen the movie, you may recall that this happens at a time when the USA and the USSR (remember them?) are about to declare war on each other and, out in space, the joint Soviet/American exploration team is in one of those life-or-death situations that drives all good stories. At that point in the story, the idea that “something wonderful” is about to happen seems quite unlikely. In each of the Odyssey movies, an anthropomorphized computer system plays an integral role, as both support and substitute for its human companions. The first, HAL, was a ‘code name,’ created by decrementing each letter in IBM by one. The use of code names is a common thread in software development. Some companies take it a step further and employ themes. Everybody in the Mac community recognizes that Apple chose a ‘big cat’ theme for the code names for macOS. Though few cared when the original macOS 10.0 was named Cheetah, by the time macOS 10.2 was in the works, people learned that it was code named Jaguar. Public reaction was so favorable that Apple started using the code names in their advertising, and now more people recognize Tiger (10.4), Leopard (10.5) and Snow Leopard (10.6) by name rather than by version number. When we began working on Helix, the big changes that lay ahead combined with the somewhat shaky foundation of our operations led us to choose a ‘volcanic’ theme for our code names. Early on they were Earth-based: Chaski, Pele, Kapiolani… Then we moved out into space, and adopted Io (the volcanic moon of Jupiter) as the code name for the macOS native Helix Client and Engine. With Io nearly completed, and work resuming on the macOS native Helix RADE, we found that the seismic upheaval concept had pretty much run its course. With six of the seven members of the Helix product family already running in macOS, things are more settled now, and so we began considering a new tangent for our code names. With Io figuring so prominently in the story line of 2010 and Io being a Jovian moon and 2010 being the year RADE is going to make it to macOS and 2010 being one of our favorite movies and… the choice seemed obvious to us: the macOS native Helix RADE project is going by the code name Europa. There. We’ve officially announced it: A macOS native Helix RADE will be available in 2010. Incidentally, the promotional title for 2010 the movie was actually 2010: The Year We Make Contact, and 2010 is the year macOS RADE (hereinafter referred to as Europa) will ‘make contact’ with the world at large. Integrated Structure Checking: The days of running Update Collection are gone. Europa automatically (after a warning) updates your collection to run the newest code, and it contains an option to check for structural integrity every time you open a collection. In its initial releases, you will still need Helix Utility for some maintenance tasks, but all those functions will eventually be incorporated directly into RADE, Server and Engine. By integrating Update Collection into Europa now, we’re making one important part of collection maintenance transparent right from the start. 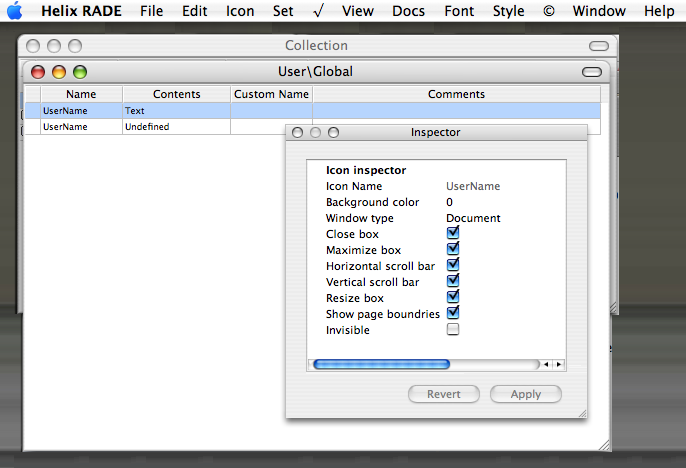 Inspector: First there was “the dialog box.” Then there were two, then ten. And then there were dialog boxes that opened yet more dialog boxes. All in all, the concept of the dialog box had a good run, but in the macOS era, it has been replaced by the Inspector, a floating window whose content changes based on which icons are currently selected, allowing you to edit everything from the same screen location. Europa uses an inspector interface, replacing the various attribute dialog boxes found in Classic Helix. deliver a product that enables collection designers to modify their database structures even before the traditional ‘click and drag’ interface is fully implemented. Modifications go mainstream: Need to create a new relation and populate it with icons? With AppleScript, you tell Helix to make a new relation and then tell Helix what to add to that new relation. All of the attributes and formatting options of every Helix icon will be accessible, so anything that can be done in Helix can be done via AppleScript. Reproducing code becomes simple: While Copy/Paste Structure and Clippings go a long way toward easing the task of updating a production collection while minimizing downtime. AppleScript will take you the rest of the way. Tedious tasks become pleasant: Need to change every place where the Geneva font is used to Futura? Or every label rectangle that contains “Code” to “UPC”? Yes, Find and Change is coming to Helix RADE. Apply changes to a live collection: This is what makes this big feature really big: Along with being able to make changes to a Helix collection in Design Mode, you will also be able to change a collection’s structure while it is in User Mode! That means you will be able to make changes to a collection while it is open in Helix Server. Did you get that? No more need to shut down the Server to make changes; just compile your changes in a script and apply the script to an open collection. Testing can be automated: One of the problems we face in working on the code is in testing to make sure everything still works correctly. Classic RADE required a manual approach to testing — everything must be clicked, dragged and sized by hand, but because Europa enables control of those settings via AppleScript, we can eliminate huge amounts of testing time, resulting in faster updates with fewer bugs. Likewise, scripts can be developed by anybody to scour a collection, looking for inconsistencies in formatting, etc. CallHelix Integration: QSA ToolWorks recently acquired CallHelix, one of a number of tools designed to provide access to Helix data from external sources. (CallHelix was originally created by Fred Stephenson (an independent developer) to provide AppleScript functionality that should have been built into Helix all along.) Europa will include the functions CallHelix provides, making the stand-alone program obsolete. Putting this together with Design Mode AppleScript will provide a complete solution for AppleScript programmers and will provide a framework for even better AppleScript and Apple event integration in the future. Helix’s new AppleScript capabilities are based on a robust Apple event suite, so third-party developers will have the ability to create powerful new ways of driving information into and out of Helix. Those who have created tools that take advantage of the handful of Apple events in Classic Helix products will find their horizons greatly expanded. Support and training for this and other new Helix capabilities will be available through an educational program that will evolve as Helix itself evolves over the next few years. Footnote: If you aren’t familiar with AppleScript, don’t worry. We’re working on some deals that will make it easier for you. All we can say for now is, don’t go out and buy any books or programs to help you learn AppleScript yet! Update Dec 31, 2010 — Click here to see what we were referring to. In order to assure that there’s a future with Helix in it, we need to be able to attract new users. But until there’s a macOS RADE, there won’t be any new users, plain and simple. Access to Europa Preview Releases, updated monthly, or as often as another milestone is reached. As each new part of Helix is ready, it is made available to the Europa Pioneers. Access to the less-than-stable weekly Europa builds. Get a preview of what we are working on as it unfolds. Access to a private discussion channel. Provide feedback on the latest developments, report bugs, and share insights with other Europa Pioneers. Technical Support without spending USUs. Any support call that is related to Europa is free for Europa Pioneers. Discounts on other Helix products. Preview Releases: Just as we did with the macOS Engine and Client, we are going to release Europa as a series of Preview Releases. But this time, there is a twist: only Europa Pioneers will have access to them. Similar to the way we re-introduced features to the macOS Client and Engine during 2009, each release of Europa will restore more Design Mode editors to the click-and-drag interface. But before each editor is available in click-and-drag form, you’ll be able to accomplish those tasks with AppleScript. In September, we ran a survey asking which Design Mode editors were most needed. Today you can visit that page and see the results of that survey, along with an expanded discussion of how it applies to Europa. The results there provide some guidelines for us to determine which editor functions to implement before which others in those instances where we will have the luxury of debating such options. When Europa at last reaches the stage where we remove the “Preview Release” moniker, the upgrade price and new license prices will be determined, in part, by the amount of time it took to get there. For example, if the subscription plan is $20/month and it takes 10 months to complete RADE, the subscribers will have each put $200 towards Europa. That would make the upgrade price for those who are not subscribers at least $200.00, and almost certainly higher. And while it is really impossible to say how long it will take to finish all of Europa, we can say we expect the plan to last close to a year. By becoming a Europa Pioneer, you’ll be getting the best price on the upgrade and you’ll be helping to assure that the ongoing work is properly financed. The first Preview Release will appear early in 2010. But no matter how long it takes to complete the job, we will factor in a way to reward those who helped us get there. If you’re thinking, “I’ll wait three months to subscribe, and I’ll save some money,” that won’t work. After the monthly subscription plan has started, the ‘buy in’ cost in subsequent months will be calculated so everybody pays the same amount. If you’re thinking, “I’ll just wait until it’s done,” you are only helping to prolong the wait. Remember: this isn’t a question of if, but of when. The Europa Pioneers will allow us to work faster, with less anxiety. This is it. The final push. 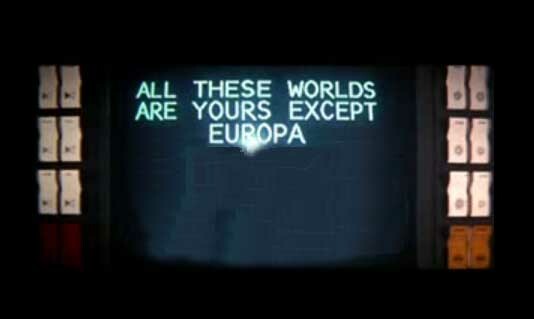 This is Europa. Finally, as David Bowman said, something wonderful is going to happen. Europa is going to appear in 2010. Helix Client and Helix Engine will get their remaining speed issues resolved. We don’t care how you got to where you are with Helix, or even how you came to own a copy of Helix. We want every able body aboard for this last leg of the journey. Everyone who participates pays the same price, whether you’re just joining the party or you’ve been along since the beginning. Everyone becomes a part of the solution and Helix is reborn for a new generation.